This week’s spring-themed piece covers one of the most talked about topics in the design sector – watercolor flowers. It’s hard to deny it, watercolor flower elements are everywhere these days. They give the designs a feel of artisan beauty and are the perfect way to spruce up a design without making it look too luxury or sophisticated but rather down-to-earth. We’ve selected some of the top places you can find free watercolor flowers. The Free Design Resources website is filled with plenty of amazing illustrations, mockups, templates, and graphics. Among which, these free watercolor flowers take a central position on the site for their untampered beauty and abstract vividness. 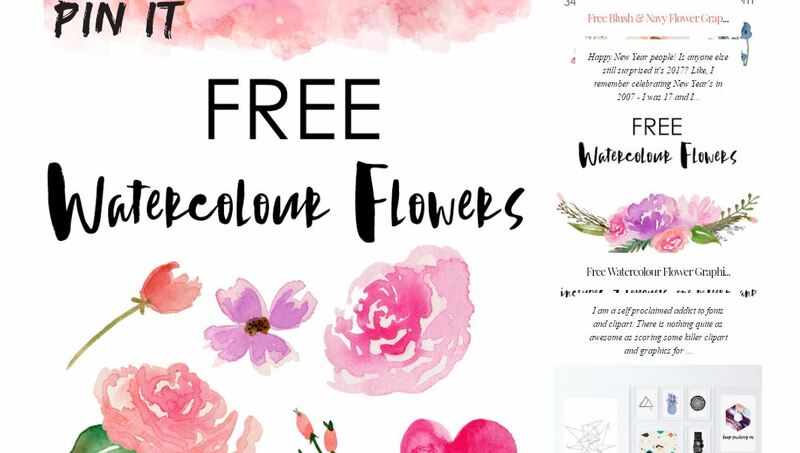 The freebie flowers collection contains 8 PNG files with 300 dpi and a handful of gorgeously hand drawn watercolor flowers you can use for free in your designs. Fox and Hazel is a chic design blog founded by Torrie, a designer and a firm believer that creativity can be found everywhere. 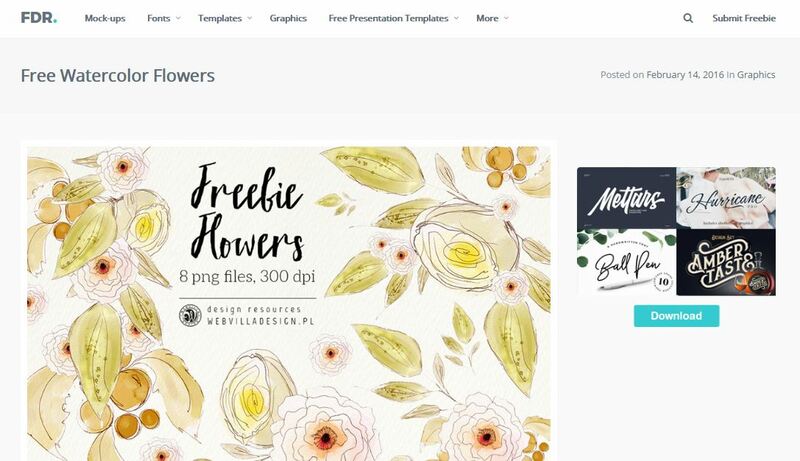 Her website has plenty of free design resources but the free watercolor flowers collection quickly catches the attention with its beauty and complexity. It contains two bouquets, one pattern, and 52 individual elements. Vecteezy is one of the most popular design resource websites for vector files. The site has a huge collection of watercolor elements and free watercolor flower designs. There are plenty of watercolor flower patterns to choose from and a wide array of different watercolor elements which can help you spruce up your design project. 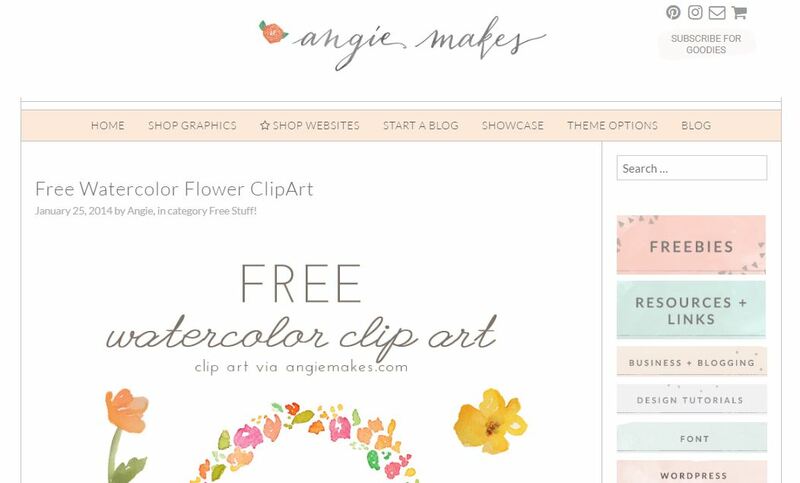 Angie Makes is a cute design blog that will amaze you with its fabulous collection of free watercolor flower clip art and illustrations. A lot of her work features watercolor flower designs and other handcrafted clip art which makes the design resources on this website unique and attractive. Angie makes some amazing things so you should definitely check her site out. The Smell of Roses is a pretty art blog focused on all things roses. It contains some amazing freebies and features some of the best free watercolor vectors that you can find online. The website has a special freebies section that contains templates, vector files, stock photography, and others which can be downloaded and used freely in various design projects. Pixabay is one of the most popular resource websites for free stock photography but what many people don’t know is that the site actually hosts a lot of clipart images with outstanding quality. Pixabay contains lots of free watercolor clipart images and watercolor flower png files that can be used both in personal and commercial projects at no charge. All design resources on this website are registered under Creative Commons CC0. The Hungry JPEG is a small but unique design resource marketplace that offers some amazing freebies along with its premium design files. The site has some great collections of free watercolor flowers. This particular bundle is created by Nadi Spasibenko and contains over 20 watercolor floral illustrations which are available for use in personal design projects. Freepik is popular for its enormous collection of free design templates, clip art files, vector and PSD resources which can be used for both personal and commercial projects. The website also contains one of the widest selections of free watercolor flower vectors and clip art files that can be found online. The designs range from patterns to vector, PSD, and PNG files which can help you turn your design into a watercolor masterpiece in no time.